On November 7, Poloniex announced that it would allow its customers to trade two pre-fork tokens prior to the upcoming Bitcoin Cash hard fork: Bitcoin Cash ABC (BCHABC) and Bitcoin Cash SV (BCHSV). Here is what the current data looks like. As The Block previously reported, Bitcoin Cash SV was originally trading at 21% of Bitcoin Cash ABC's price. Four trading days later, Bitcoin Cash SV is now trading at 30% of Bitcoin Cash ABC's price. One possible reason for this closing price gap is the market's acknowledgment that the three largest Bitcoin Cash mining pools (Coingeek, SVPool, and BMG POOL) are all associated with Craig Wright — the self-appointed leader of Bitcoin Cash SV. 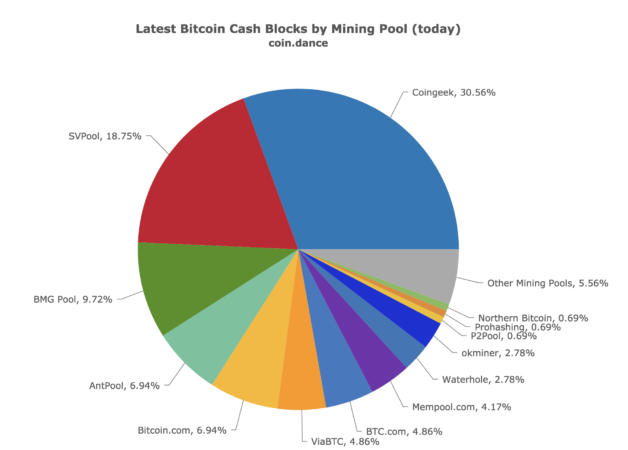 As of the time of this writing, these three mining pools have accumulated nearly 57% of Bitcoin Cash's hash rate, according to data from Coin Dance. A 51% control of the hash rate could allow Craig Wright and his associated to essentially determine what blocks get accepted to the Bitcoin Cash blockchain.